Gotta say I was unimpressed with my Razor-E version. I thought the illumination bleed over was defective, sent it to Vortex but they said today it is 'working as it should'. I actually like the PST Gen 2 a lot better than the Razor after seeing them both. Razor is brighter (10 on the PST is about 7/8 on the Razor), but the top reticle line bleeds over bad if you look into low light areas. Since it's NIB, I've requested a refund and will be purchasing an NX8 instead. I hate to hear that. Mine doesn’t bleed at all, just gets brighter. Let us know when you get the NX8. I was ready to order a Razor this weekend but they sold out. The JM-1 has been out for a bit, but Eurooptic still had VM2 MOA until after lunch on Friday. I was going to put it on my SCAR 17, possibly try and use it in a dual role with a 5.56 carbine or pistol. Not sure I can afford to go up to the ATACR. Trijicon 1-8 was my other choice, was leaning to the Razor for the 1x eyebox and redot dot performance. At the time this was about the only serious contender in the 1-8 game. I believe there are better optics in terms of glass out there today but I haven't found the Trijicon lacking in any meaningful way enough to want to upgrade. I also used just about every 1-6 out there, I went with the Leupold VX6 when factoring cost/performance, performance alone I would have gone with the Kahles or Swaro. As mentioned above, ID be hesitant to run the Swaro or Kahles on a SCAR 17 from a durabilty standpoint. K16i works just fine on the SCAR17. Sample size of two, but neither had issues. One in Bobro mount, other in a NF mount. The best of the breed are the NF atacr, nx8, Kahles k16i, and S&B 1-8 SD CC. The glass and illumination of the trijicon 1-8 are absolutely not on par with the others (excluding the vx6 and trijicon 1-4) on the list. It’s a nice optic, but not one I would choose over the Kahles or NF offerings. The ATACR and nx8 are currently best in class for the 1-8 IMO. If you don’t need the extra 2x, the k16i is outstanding. Best FOV, forgiving eyebox, ultra bright ilkumination, SM-1 reticle doesn’t require illumination to be used on 1x. The glass is amazing. On 1x the optic just vanishes and you’re staring at the reticle. Best is subjective. Without knowing what someone looks for in an optic, its hard to determine whats best. For the guns Im using most of my 1x optics on, glass quality is not paramount, its nice to have but not really needed. Same for illumination, while others may be brighter, I don't need my illumination to to rival the sun, the black reticle is bold enough to pick up just as quick in most conditions. Lastly, cost, the Triji 1-8 can be found for 900ish, most of the other 1-8 optics will run about double. While it may not score 10's in any category, you'd be hard pressed to find something beter in its price range. Individual needs are subjective. The features that amount to “best in class” are objective. And even while I believe the ATACR is the current best in class, it is not perfect. There is no perfect, unfortunately. So the end user looks at the objective features and the cost to have those features and makes an educated decision. The Trijicon isn’t bad, it does a lot right and the ATACR street price is about 2.5x that of the trijicon. I wouldn’t feel under gunned with the trijicon 1-8, it simply didn’t fit my wants/needs after shooting essentially every contender on the market. I decided after posting this to get an ATACR. I would normally mount it in a bobro mount as that's my usual choice on the scar since I can get the levers reversed. But it seems there is a NF promotion on one of their mounts for free. Can one of you with a SCAR tell me which of these I want? I almost bought the Trijicon 1-8 from you a while back for this role. Still putting off the purchase. I have the Trijicon 1-4 Accupoint, previously on my SCAR17, now on a 16" 5.56 Carbine for gun games. I believe the 1-8 isn't as good at 1x as the 1-4, 1x being the majority of how it will be used most likely. Brightness wasn't a big factor, performance at the top end will likely be good enough for me no matter my choice, stretching at best to 400 yards I'm not worried about FOV, or SFP/FFP. The EOTech 1-6 had my attention until I tried one and confirmed the eyebox and comfort behind the scope was noticeably worse than the Triji 1-4, and that's what I think I'd like to upgrade most. So I've kind of re-oriented around the Razor 1-6. Can one of you with a SCAR tell me which of these I want? Not a SCAR owner, but familiar with NF unimounts. The extended unimount is primarily for ARs with limited rail space on the upper receiver, and for shooters who's shooting position puts their nose right on the charging handle. 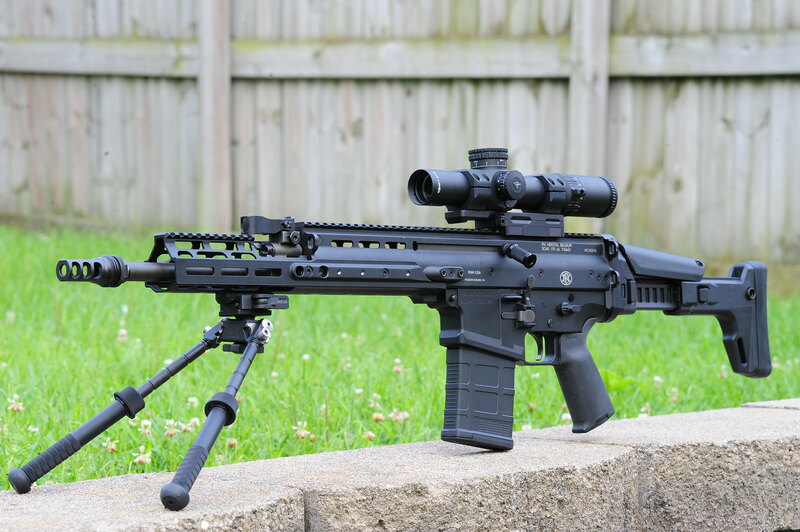 With the long rail of the SCAR, the extended mount isn't necessary. But it won't make much difference, either. Cant will be your preference. Your scope has 30 mils (100 MOA) of travel. Meaning without a canted mount, you'll use up maybe 5 MOA attaining a zero. So maybe you have 45 MOA of up travel and 55 MOA of down travel available on your elevation dial. With a 20 MOA mount, you'll have maybe 65 MOA of up travel and 35 MOA of down travel. I'm assuming the rail is flat on a SCAR. As I see it, the ATACR is designed not to be dialed for elevation. The capped dial and the "Christmas tree" reticle indicates this. Therefore, I'm uncertain if one version is any more suitable than any another. In my own case, I often shoot my rifles at extended distances. So dialing in 10-15 MOA of elevation is pretty common in competition and training. Therefore, I prefer 20 MOA cants on all my ARs, as it keeps me a little better centered in the scope's glass. The VX6 is everyting the Razor is but half a pound lighter. Optically the VX6 line is pretty close to glass costing twice as much. What "objective" points makes the ATACR better than the Z8i? My objective points only has the ATACR leading in durabilty, which is actually a subjective need since some people dont really need NF like durabilty. Well I should get my NX8 tomorrow and already have a Geissele Mount waiting for it. Vortex was good about the refund on the Razor -E, so I can't say anything bad about it. IME, the Vortex Razor -E doesn't offer much over the PST G2 1-6x24 except brighter illumination; however IMO the bleed it can experience in lower light is unacceptable. Sure, it's got better glass if you are going to try and stretch target ID and shots out several hundred yards, but beyond that I don't see it. When comparing lots of the features discussed here, I think it comes down to personal preference and things you want, where you shoot, what you do. Vortex, Nightforce, Kahles, Steiner, Leupold, Trijicon, etc - they all have something to offer at different price points and capabilities. Great times as a firearm owner to have so many options. Just too bad they are (1) expensive and (2) difficult to get behind before you buy. I have never seen or touched a Z8i, so I can't comment on it. Durability sure seems to be important consideration with NF. Most of us steel/precision/tactical matches dial our elevation from shot to shot. Lots of dial turning -- for elevation turret, anyway. We tend to use the reticle for wind holds. Anyway, NF turrets seem to be built better than most scopes out there -- well enough that we rarely hear of them crapping out. The same cannot be said for most scope brands, as elevator failure is likely the #1 reason for scopes going down. Evidently, some of the top competitors have seen this happen enough that they use a scope for only one season, then sell it over the winter, and buy a new one for the next season. Of course, this is an easier practice those who have scope sponsorships. In my own situation, with an NSX 5.5-22x Nightforce, stupidity of not locking a Pelican case after shooting led to a big "oops" when I got home that evening. As I pulled the case out of my SUV, the 17-18 pound rifle fell close to 2 feet onto the concrete driveway, landing squarely on the scope's left turret -- which controls illumination and parallax. The turret cap broke, pieces flew, and there was a small dent in the end of the turret tube. But when I taped the pieces back together, held them onto the scope, both illumination and parallax still worked. I clamped the rifle into bench vise and it appeared to track correctly in my basement for both windage and elevation. NF fixed my "oops" for about $100, stating the scope was still in spec. I still use the scope today. NF elevator durability may not be such a big thing for the ATACR 1-8x. The scope's reticle design, capped elevation turret, and lack of a zero stop means that NF pretty much assumes the users won't be dialing elevation. NightForce turrets will spoil a shooter, that is for certain. Bank vault like clicks and precision, especially compared to Leupolds (3), Vortex (3), and Trijicon (2) scopes I own / owned. Sure, not everyone 'needs' that durability but it's nice once you experience it. Sure, not everyone 'needs' that durability . Pretty much my point. Hard to say whos "best in class". Especially if that kind of durbality is not needed. NF was my firt pic when looking for a 1-8 but they were really late to the game, skipping the 1-6 game all together. It is strange that NF skipped over the 1-6. Maybe one day we will see one. Re: z8i, I’ve not used one. Nor has anyone else I know. I did look through a z6i years ago. I’m sure the z8i has awesome glass. Speculating, I would say the turrets, illumination controls, and (maybe) the durability are likely bested by NF, but without laying hands on it I cannot say. The reticle is less than ideal for me, but that’s subjective not objective. The other optics I’ve not used, but would like to try are the Minox zp8 and Steiner m8xi. Vortex was good about the refund on the Razor -E, so I can't say anything bad about it. IME, the Vortex Razor -E doesn't offer much over the PST G2 1-6x24 except brighter illumination; however IMO the bleed it can experience in lower light is unacceptable. What setting were you using the illumination on? I've got bright sun and snow cover at my house currently and if I look out the window through my Razor on setting 8 it is a bright dot and then if I look into a dark closet I do get some bleeding of the illumination onto the upper vertical stadia. I've never had it be an issue unless I went between two drastically different lighting conditions, but it is there as you describe. I have heard that the NX8 has excellent illumination. I will be curious to see if the bleeding of the light onto the rest of the reticle will be absent on that optic. I assume they considered it to be a somewhat cluttered market segment and decided to just go on to the next step and offer two 1-8 offerings. Just an assumption though. Ok so I checked it out and yes I can make it bleed on the upper vertical crosshair. But I never run it that high even in sunlight. Yeah I've heard the same thing from others after the fact. I guess I was 'setup' by my PST G2 1-6, because only the dot illuminates on 10, even though it's only around the 8 intensity of a Razor. I've seen optics 'bleed' before on max, but only around the actual illuminated area, not that line. But it's just the way the Razor is designed after talking with them, it was just odd that nobody ever mentioned it on reviews. Like ever. In the end after talking with the Vortex Rep, I just don't feel the Razor is 2x plus the scope of the PST 1-6, but that's what it is price wise. Better glass, yeah. More Illum, yeah. Likely a bit more durable, but after seeing the ODAs running PST 1-6s down range, I doubt they would use them if they broke often. NX8 just arrived and has the looked & feel you expect from a NightForce. Illum is crazy bright and as advertised, it doesn't have the eyebox of the Razor but appears true x1 after you get the diopter adjusted. I will likely mount it this afternoon and maybe the range this weekend if it warms up some.